Today we are going to return to one of the big subjects on the blog, gentrification. Did you think yours truly was going to say immigration? Maybe tomorrow. We have talked a lot about the impact of gentrification on communities and people. We are returning to the subject of how gentrification affects people. 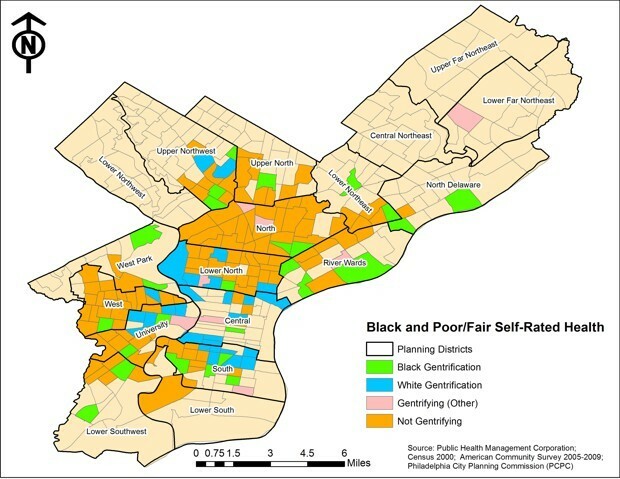 Specifically, we are going to look at new study, The Association of Minority Self-Rated health with Black versus White Gentrification by sociologists Joseph Gibbons and Michael S. Barton, published on October 19, 2016 in the Journal of Urban Health (http://www.link.springer.com; date accessed mar. 28, 2017). 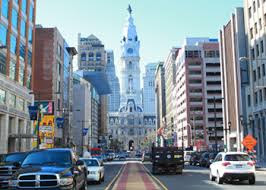 Our guid for the day is Richard Florida's CityLab article "Race, Gentrification, and Health in Philadelphia." The question to consider is do African American residents in gentrifying neighborhoods experience better or health? Shall we find out? Richard Florida begins, "The impact of gentrification-especially the displacement of lower-income residents-remains a topic of enormous debate in urbanism circles." True enough. The majority of research on the topic found that the "the extent of displacement to statistically rather small, in fact,..., Lance Freeman of Columbia University, argues that widespread displacement caused by gentrification is largely a myth." However, this does not imply that long-term residents do not experience other effects. The study conducted by Messrs. Gibbons and Barton provides fresh insights into gentrification by studying the health and well-being of African American and Caucasian residents in the throes of it. The co-authors point out, "the Centers for Disease Control...lists a variety of adverse health effects that may stem from gentrification and displacement, particularly increased stress that can lead to mental health problems, health problems, premature birth, and in some cases death." 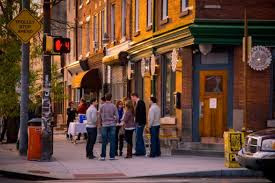 The study goes deep into the link between gentrification and health using a sweeping health survey (http://www.chdbdata.org), conducted in Philadelphia, a city that has experienced widespread gentrification. The survey assembled specific information on individual health status and conditions, health-related behavior and access to health care as well as demographic and socioeconomic traits. Mr. Florida writes, "Gibbons and Barton use this data to compare the health outcomes on black and white residents of gentrifying and other neighborhoods in Philadelphia, using the conventional measures of gentrification-changes in housing in housing costs, incomes, and education levels across neighborhoods or Census tracts." 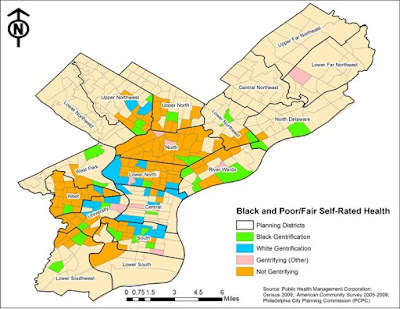 The map above left identifies the different neighborhoods in the process of gentrifying in Philadelphia. The map reveals an very fascinating fact: "Nearly 80 percent of the 968 neighborhoods were considered non-gentrifable; a third of the other 20 percent were found to be gentrifying." Further, out of that third of the other 20 percent, "31 neighborhoods experienced white gentrification and 29 experienced 'black gentrification'-where middle-class black residents move into lower-class black neighborhoods." The study developed and used statistical models that analyzed the effects of this process on individuals's health. Income, education, employment, race, and other factors were the control factors. Once the gentrifying neighborhoods were identified, the study linked the responses of the health survey to the places where the respondents live. Richard Florida writes, "While gentrification has an overall marginal effect on improving self-raid health, it led to worse health reports from black respondents." 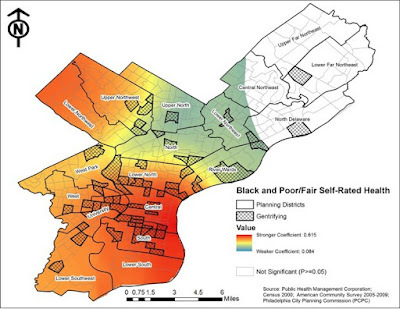 The map on the left-had side diagrams the strength of the correlation between race and self-rated health in neighborhoods around Philadelphia. What we find is African American respondents "...were more likely to rate their health as poor or fair neighborhoods that are gentrifying or those that are nearby..." In general, African American respondents "...were 27.3 percent more likely than white respondents to report poor to fair health." However, African American respondents residing in gentrifying neighborhoods were nearly "...75 percent more likely to report poor-to-fair health than counterparts in other neighborhoods. When factoring in additional socioeconomic results, the outcomes conclude that there is some doubt that poorer result for African American respondents in gentrifying neighborhoods is caused by displacement. 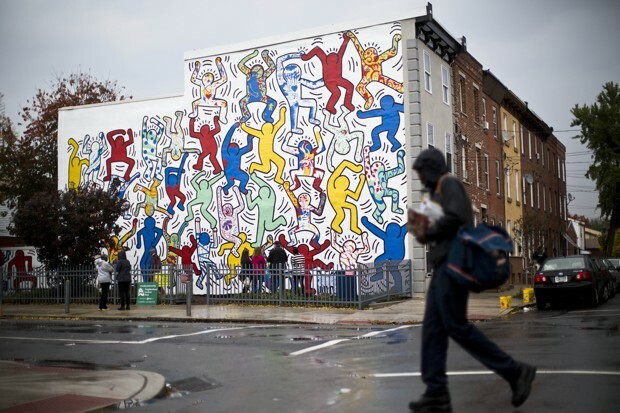 Joseph Gibbons and Michael S. Barton argue that "the endurance of these bad health outcomes suggest the subtle effect of gentrification's cultural displacement." Further, "That change is also difficult to quantify: Self-reported bad health outcomes had similar correlation in neighborhoods experiencing black gentrification." Whatever the gentrifying process may be, The Association of Minority Self-Rated health with Black versus White Gentrification alluded to the idea that importing affluence and resources to a community is not necessarily beneficial to long-term residents. Like the income gap, disparities in health, effecting rich and poor, are more sustainable.